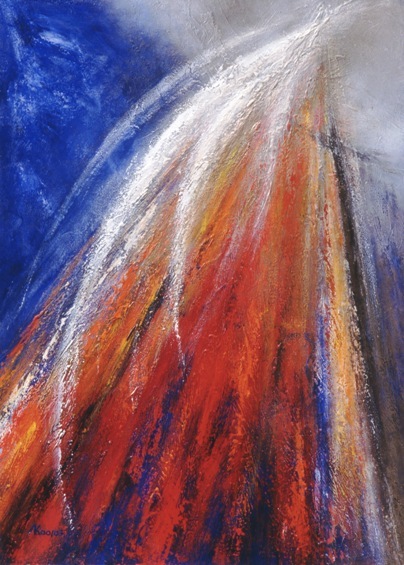 An abstract painting that reveals an awesome outpouring of grace. See a larger version of the painting. The eighteenth-century Jesuit priest Jean Pierre de Caussade once noted: "Divine action has always been the source from which flows a torrent of grace which spreads over everything. Henceforth I shall no longer seek it within the narrow confines of a book or the life of a saint, or a sublime idea." In this painting, we experience grace through art. In this 2003 abstract painting titled "Grace," Anneke Kaai, a Dutch painter, immerses us in the powerful image of a waterfall of many colors. In the Christian tradition, grace cannot be possessed or controlled, only accepted in surrender to God. Kaai puts before our eyes the awesome nature of this spiritual gift, which exudes beauty, passion, and astonishing energy. Grace challenges us to consider grace amidst the surging and the plunging of our faith. It invites us to open ourselves to the magical downpour of the cascading water and to go with the flow. The torrent of grace promises to take us to new places. Kaai's painting is included in In a Word: The Image and Language of Faith, a book which brings together 23 key words of Christianity and presents interpretations by Anneke Kaai and theologian Eugene Peterson. The Christian artist has created nine series of paintings on biblical themes. See some of them at her website.